Final Fantasy XIV: Heavensward is a cacophony of everything one could love about an MMORPG mixed with a few new ideas that range from great to frustrating. Among the great parts of the game are the incredible soundtrack, gorgeous world, intriguing soundtrack and inherited class system from its predecessor. Truthfully, any of the elements of the game that you would expect from an MMORPG are done perfectly, without redefining much. The pieces of the game that have redefined the MMO experience (being able to enter matchmaking for a dungeon or group quest known as Guildhests anywhere) are my favorite idea. With Heavensward being an expansion, it would go without saying that they’d add new pieces to the world, potentially new monsters and definitely a new class, with easy access right? Right?! Unfortunately, this is where Heavensward falls short. In order to dive into the expanded content you are required to have finished the entire storyline for Realm Reborn. This doesn’t mean just the storyline for the original content either, it means THE ENTIRE STORYLINE. Therefore, those that hadn’t played through every chunk of patch content, or who were looking to dive back into FFXIV were left with the surprise of spending additional hours inside of Realm Reborn before they could move on into the new world. As one who had spent multiple hours blasting through Realm Reborn, but hadn’t decided the patch content was something I was interested in, I can tell you this is quite the feat. Aside from the drawback listed above, Heavensward is an absolutely breathtaking thrill ride, and again the world is gorgeous! 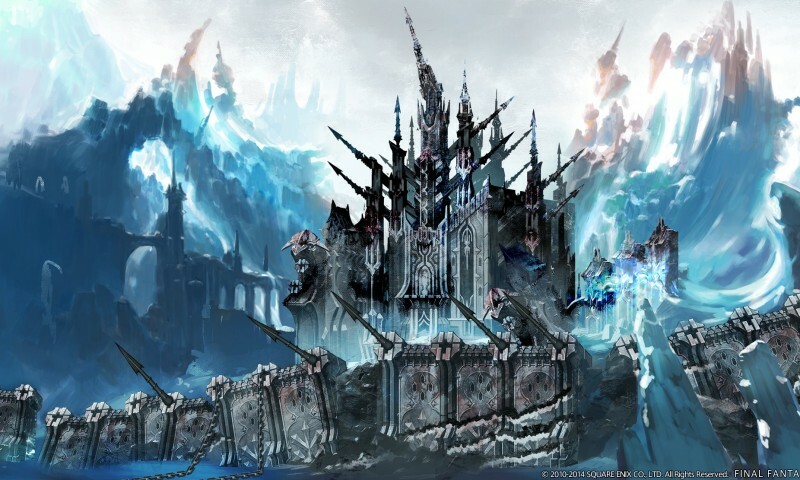 The starting point for this world is based on my favorite part of Final Fantasy XIV (the Coerthas Central Highlands) where you immediately move on to Ishgard. 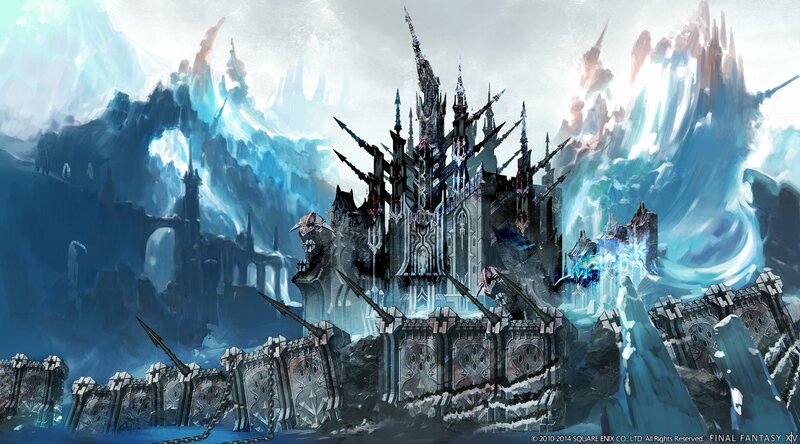 The stunning castle town more than rivals the parapets and scenery of Limsa Lominsa and the open world outside of the castle walls are filled with what you’d expect in a game called Heavensward (flying continents and the like). Here’s where opinions of the expansion may begin to split from “I love it, it’s gorgeous” to “I’m bored, I want it dead.” While everything about the game is gorgeous, well-rounded, and interesting to see, the mechanics of the game have not changed at all. From the quest system, to the way the story proceeds forward, to the dungeon and boss fights, there isn’t really anything new to this expansion. Sure, the dungeons are different as they’re new, but even many of the mobs you’re slashing through for earlier quests are the same models from down below with a new color attached to them. If you’ve just finished a grind through all of the expansion content you missed to get to Heavensward, it can seem like you’re simply playing more of the patches and not getting into the meat of new content. While you are rewarded for getting through this monotony, many players may be deterred by this. As it is with many MMOs Heavensward is not for everyone. From an MMO stance, it is still the best game in the genre on the market, ready to help scratch the drug-like need for a good grind. Stepping into Heavensward without having finished every piece of content from it’s predecessor will be a risk the gamer as the absolutely overwhelming amount of content patched into Realm Reborn makes Heavensward seem unattainable at times. Go forth and grind.